Whether your computer is a top shelf server or a "Frankenstein" model, stitched together over the years, we will use our arsenal of tools and knowledge to fix your problem quickly while respecting the privacy of your data. 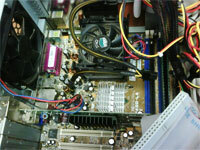 If your computer or anything attached to it is not functioning properly, we will be able to diagnose the problem. Once we have our diagnosis, we will be happy to advise you on the best course of action with respect to the cost of repair versus replacement. We know that computers are an important part of life and business and we are capable of repairing even the nastiest of problems. PCs or Macs, desktops or laptops are welcome. We also look at cell phones...if it's not functioning properly or you have a question, bring it in and we'll take a look. We will give you quotes for our work before we do it, and we will do our best not to go over our quoted price without talking with you first. The hourly rate for a Computer Express technician in the shop is $80. Contact Us with your questions.